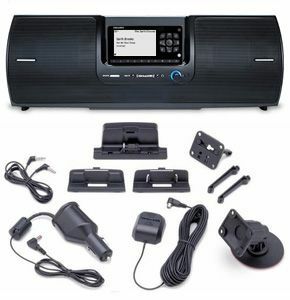 This bundle package includes the XM Onyx EZR receiver, PowerConnect vehicle kit and SXSD2 boombox! Take your favorite programming with you - from the home or office to the patio, park or anywhere in between. This convenient boombox has a concealed fold up handle and built-in antenna cradle with cable storage. Operates at home on AC power or take it anywhere with batteries. Auxiliary input jack lets you connect an MP3 player or phone for playback. Enjoy SiriusXM Satellite Radio in your car and boombox with this XM Onyx EZR Radio, all with just one subscription. The radio features a large 3.2" high-resolution display and includes a PowerConnect Vehicle Kit for easy installation. Create your own music channel from selected channels with TuneMix. Store up to 10 of your favorite channels and view what’s playing on those channels in split screen mode. Choose from two display options and view artist or show name, song or program title and content or channel information with up to three lines of data. Easily lock and unlock channels with mature content with the parental controls.